Ostia Antica is an incredible 2,700 year old Roman ruins area about 10 kilometers south of the Fiumicino airport (where many budget airlines fly into) and 30km west of Rome. Visiting this historic city will transport you through time and give you a much needed break from the bustling city center of Rome. It's a relatively easy day trip from Rome, but many people try to squeeze it in during a layover at or before a flight from Fiumicino. 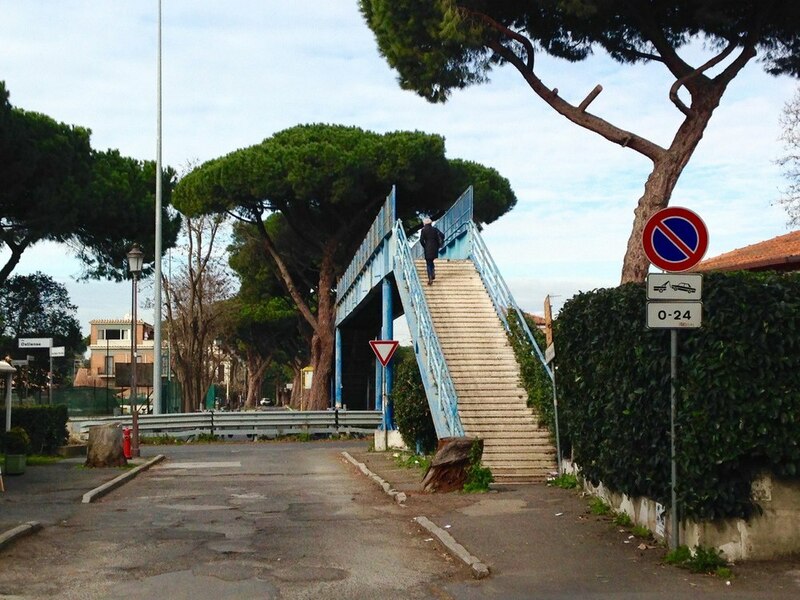 The bad news with that is it seems no one knows how to get to Ostia Antica from Fiumicino using public transportation. As a solo traveler to Rome, I was determined to see this ancient city without paying 40-50€ for cabs. And you know what? I did it! It's possible! And it will only cost you 5.6€. 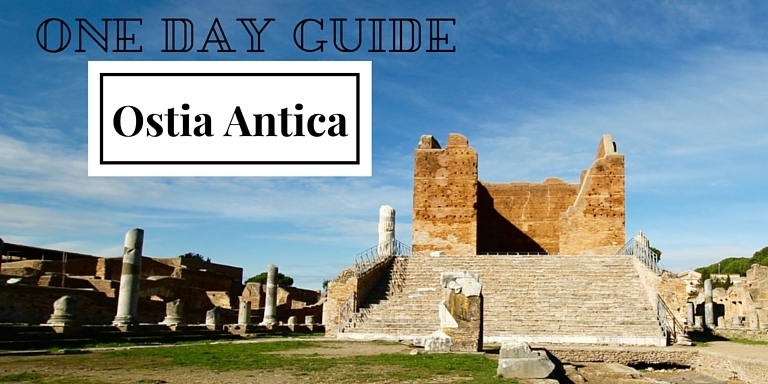 Want a complete guide to a day trip to Ostia Antica including a 17-page explanation of the whole site (the only answer is yes...)? Download it here. Inside the arrivals level of T1, buy two bus tickets (one to get there and one to return) for Lido di Ostia from any of the little magazine/tobacco shops. These are 1.3€ each. If you buy them on the bus, they'll be 7€. 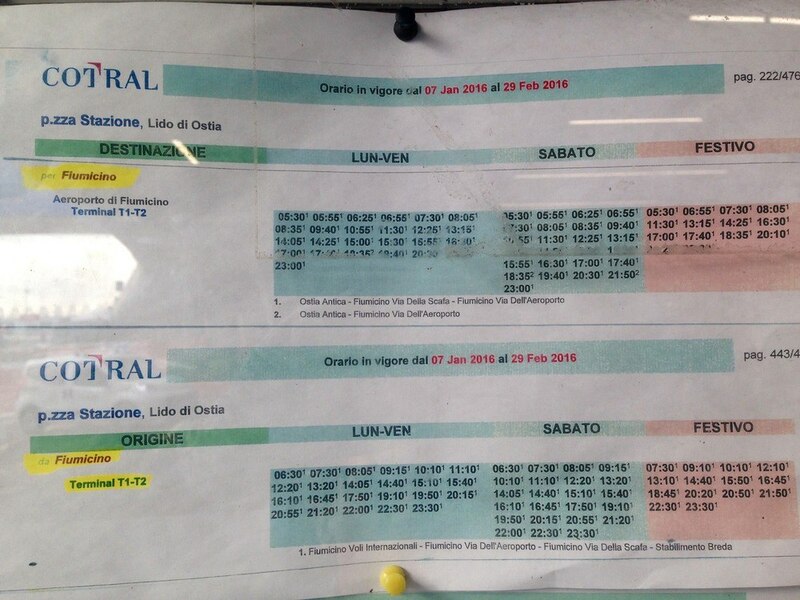 Hopefully you will see a timetable for both to and from Fiumicino with Lido di Ostia listed as a stop. Take a picture or make a note of all of the return times that could work for you. Once on your bus (it should have “Lido di Ostia” scrolling across the front), ride it for about 20 minutes to the very last stop - Lido di Ostia. You'll be at a train station. Buy a 1.5€ ticket (good for 100 minutes) and from platform one (binario 1) go two stops towards Porta S. Paolo. Get off at the the Ostia Antica stop. Exit the train station and walk straight. Go up and over the freeway on the blue staircase. Once over the freeway, continue straight for a few minutes. You'll come to a pretty large intersection (Viale dei Romagnoli) with a public water fountain on one corner, a cafe across the street, and a gas station down the road to the left. Continue straight down the road in front of you (where the black car is pulling out in the image below). 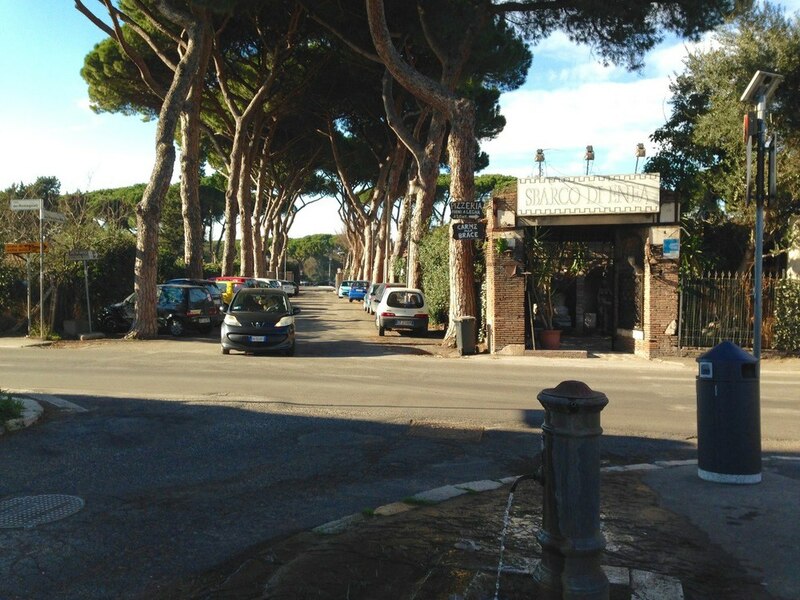 5 minutes later you will be walking up to the ticket office at Ostia Antica. Hooray!!! You made it! Alright, now getting back is essentially all of the same steps backwards, but it seems to be the hardest for everyone. I will say that in my experience the Cotral bus was supposed to come at 2:25PM, 3PM, or 3:30PM and the one I took back to Fiumicino showed up around 2:40PM... so just make sure you're not cutting anything too close. Other details: There can be a bit of dead time between waiting for the bus and the train. The actual transportation time is about 45 minutes, but there can be up to an hour or so of waiting time depending on how everything aligns. I would allow 1.5-2 hours to get to Ostia Antica and another 1.5-2 hours to get back. If you have at least 6 hours from the time you get to the airport, there's enough time to make this trip. 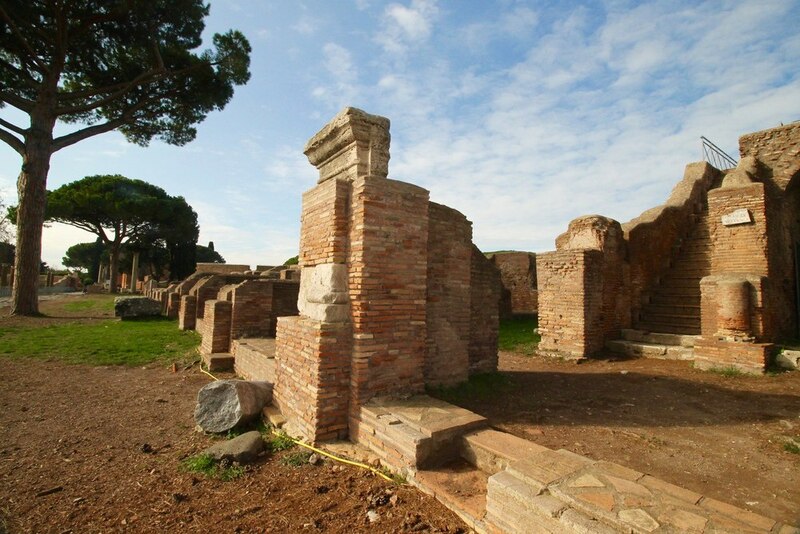 Any more time is great (you could spend hours at Ostia Antica), but it's doable in 6. When I took this trip I did not have the nice little outline above, so I just asked every person I came across as many questions as possible. When the first bus showed up under the “regional bus stop” sign I asked, “Lido di Ostia?” He said no and so I asked, “Do you know when?” He told me to check the sign. “Ummm... it's hard to understand, do you know when?” “No... well.... one minute. Wait, one minute.” A couple of minutes later he had come down from his driver's seat and was talking me through the schedules. We figured out the next departure time and I then asked which schedule was for the busses coming back. He pointed it out and I was set. If at any point during your trip you get stuck, my advice is to just keep asking. Some people will be helpful, some won't, but in my experience most people will at first say no and if you ask again they will try to help. As another example, I started trying to buy my bus ticket in T2. I asked the first person, “Do you sell tickets to Lido di Ostia?” She said no. I could have walked away and tried the next person, but instead I asked if she knew where they were sold. She told me T1. Great, I was off to T1. I went to another wrong person there because I was on the departure level. I did the same thing and they told me I had to go down to the arrivals level of T1. 3rd time's the charm :). My outline should be incredibly helpful in getting you to Ostia Antica without any problems, but if you ever get stuck, just ask. Italians are nicer than the stereotypes would have you believe :). Was this information helpful to you? If so, please consider a donation to help keep California to Catalonia 100% ad free. Bonus! Good job, you made it all of the way to the end. 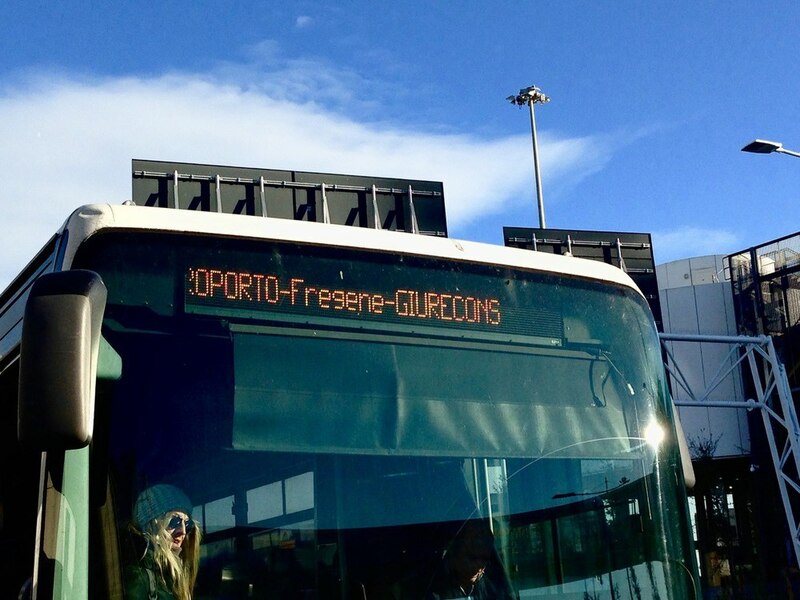 If you'd like to try to **search for the Cotral bus schedule before arriving at Fiumicino, you can by following this link. **Remember that when I took my trip, the return bus showed up in between the expected return times, so don’t cut anything too close even if you believe you know exactly when the bus should arrive.